Re: 1495 - R.I.P. V.C.s? I'd been wondering if we'd ever get a follow-up story about the beasty in the park. I've missed something here. Can someone direct me to the original beasty in the park story? London Falling: Great mini-series! I thought Si was going to blow the ending but the twist was really brilliant and elevated the whole thing well above "OK". Tharg also reminded me of Roadkill and the Scrap. Two of my all-time favourite thrills. More one-offs Tharg! What? Next prog? Cover- I quite liked this cover. Dredd- Not so keen on this- horrible monster turns up and butchers citizens then bounds off into the park. And? So? Much more interesting things could be done with Chesterton- shoot the pointless monster and invent some sort of strange subculture for the park, like the Undercity or the Jungle. Better still- a mini-epic tour of the whole park with lots of weirdness, like the planets in Judge child. Each episode or so a self contained story within a greater plot. Or something. Red Seas- Brilliant art, fantastic script- imaginitive and witty- reminds me somehow of old days spent playing AD&D. This and London's Calling have been the highlights since they began- far more original than any Hollywood nautical tomfoolery. The VCs- Having been indifferent to the story earlier, and mildly interested later, I have to say- I don't want it to end for ever. A bit of a more action packed story would be good. The Polity is arse (are arse?). Have a civil war- once the apologist geeks seek to join the humans, an open revolt by Earth colonies not wanting to join forces with the enemy or something, with the VCs going in against there own kind. More opportunity for pathos. I find it hard to sympathise with bug-eyed alien scum! London Falling- Really liked the ending. Top stuff. Glad it won't be back. You can't top it, I can't see any way to go with it now. Write another excellent one-off instead. I thought Droid life was funny. the cover was just okay. London Falling was brilliant but I wanted it to go on longer. Felt like it was only getting started. 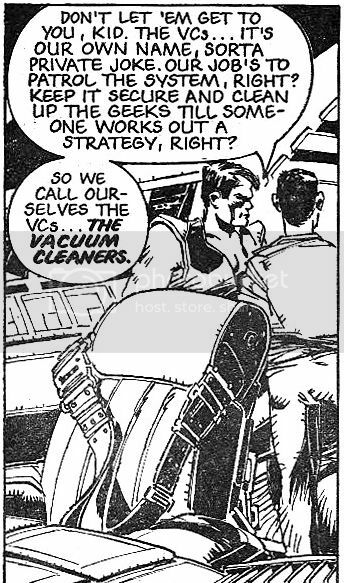 >Yeah, it's vacuum cleaners - I think Logan posted up a screenshot of it being explained in the original series - but I can't remember what thread that was and I fear search functions.